Fears are mounting that the next horse meat scandal is just around the corner, as big supermarkets may soon be allowed to avoid inspections from Government officers. Under money-saving plans being devised by cash-strapped food safety watchdogs, "trusted" retailers will be given special permission to police themselves. The move comes after major cuts to the Food Standards Authority's budget meant it could no longer cope. It is being described by experts as the most scandalous Government decision on food safety in recent history. 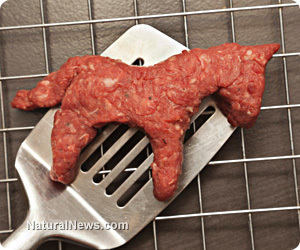 Tesco has been selected to pilot the scheme despite being at the centre of the horse meat scandal just four years ago, in which burgers being sold as "beef" actually contained mince made from horses. Tim Lang, Professor of food policy at the Centre for Food Policy, at City University, told the Grocer magazine: "This is scandalous. It's a sign of a weak FSA. "The fact it happens to be turning to Tesco, of all companies, in time of trouble, is a sign of the resurgence of Tesco just four years after Horsegate, but also very bad news for public health." However the FSA claims the move will allow it to launch a full on crackdown on restaurants and retailers with poor hygiene ratings, which it claims are the "real threat" to public health as they are more likely to make customers ill. Under the scheme retailers which can prove they meet top hygiene standards would become exempt from visits from trading standards officials and will instead be allowed to hire a private firm to do the checks. It will also apply to restaurants, and the FSA has selected pub chain Mitchell & Butlers to partake in the three month trial. The scheme could be in place as early as 2020, however the watchdog does not appear to have worked out a number of crucial details of how it will work. A spokesman from the FSA told the Telegraph: "Before retailers are allowed to do this we have to make sure they have the level of assurance we are looking for. Right now we don't have the details of how we would get that assurance." Dr Mike Bromley, founder of Genon Laboratories, which tests food, said: "I would be worried that it could open the door for food contamination and food fraud. And I still think we need a system of inspectors from the FSA on the ground to make the system safe."